I have this beautiful photo that I’ve wanted to show for a while now. The natural, romantic look was created by the Brides local team using our headpieces. Yes, I said headpieces, plural, I LOVE, LOVE, LOVED the concept and their use of the pieces. I love it for a few other reasons also: First of all look at this glamorous and dramatic rolled ponytail. Wow she must have really long locks! I love how the hair drapes a little over the ear adding to the loose slightly casual feel. Wouldn’t this look be beautiful for a beach ceremony!? The piece you can really see is the above pictured North Star Hair Ornament. It’s a very pretty sparkly piece chunk full of Swarovski crystal. The placement in the photo is beautiful even without the addition of the other piece. I have this piece made in all pearl but haven’t gotten around to adding it to the collection. It’s beautiful too- I try to get that added soon to show. 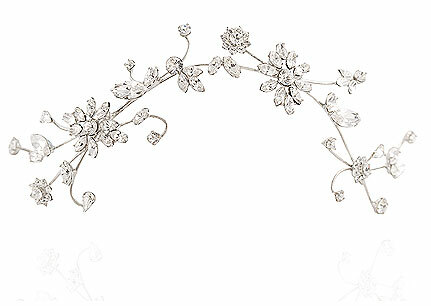 The piece that you can just see peeking over the side of the models head is the Honeysuckle Rose Headpiece. It reminds me of a garden- a lovely romantic garden– another place this look would be well suited for! The Honeysuckle Rose is one that can be worn in front as shown here or in the back above, say a loose rolled ponytail, or a big chignon. It’s really one of my favorites, the detail of which are somewhat painstaking to make. The idea of combining two or more pieces to create a look is not often explored, but I think if done carefully it can be beautiful! 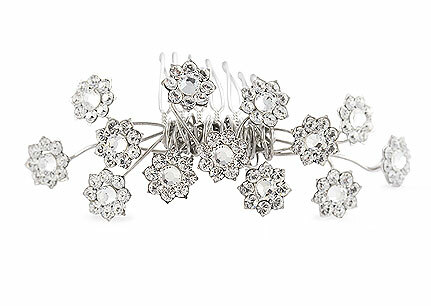 Tell me: Do you have any plans for unusual placement or combinations of headpieces? « Welcome to The Tiara Blog: a Space to Write about Love & Sparkle!